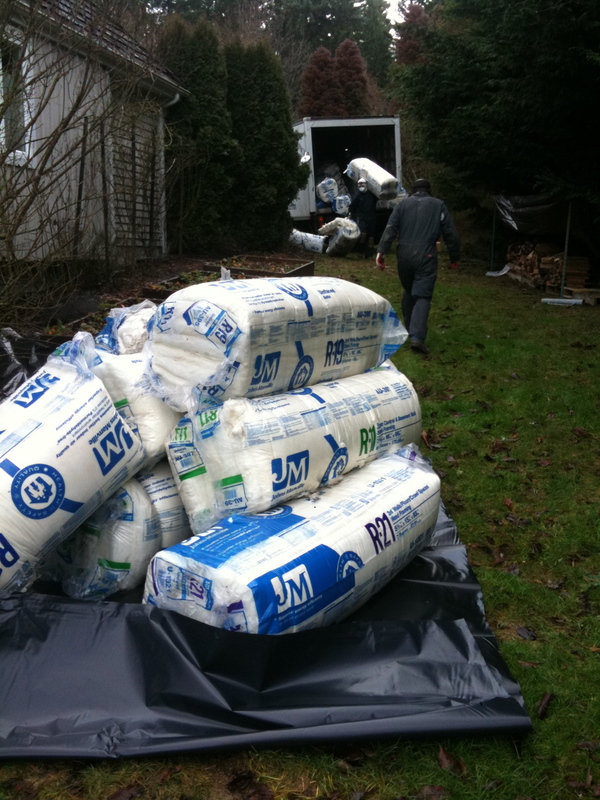 …is improving your existing structure with insulation. It’s a relatively inexpensive project with a one year (or less) payback. As a follow-up to our energy audit, we hired a three-person crew to spend 12 hours under our house adding another layer of high R value insulation. I would not recommend this as a DIY project. Three pros * 10 hours = 30 hours to do the job right. If I tried this myself, I would make enough mistakes and have to learn the basic efficiencies on the work at first, so we could safely double that hour amount to 60 hours. And given that I could only work on it in the afternoons, and only on some afternoons since it would be difficult to get to my work phone while fully geared up for insulation (full head protection including a mask), I’m guessing those 60 hours would be spent in 3 hour chunks spread over 20 days. Three weeks! Yikes. It was well worth the added expense to have pros do it in a single day.